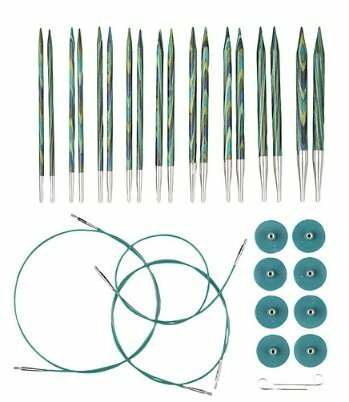 The ultimate in knitting versatility - mix and match knitting needle tips with cables to easily create the circular needle that you need for your next project. Featuring smooth joins, perfectly tapered tips and flexible cables, this set includes 9 wood needle tips and 2 sizes of cables - all of which are stored in a handy vinyl case. Two small cable keys are included, which allow you to tighten your needle tips to the cables. Working on multiple projects that call for the same needle size? Use the included endcaps to safely store your project as you start the next.